Language is an important feature of living beings. It is very difficult to imagine life without verbal transactions. Verbal cognition is thus a very important type of cognition and of special interest to the epistemologists. Language operates in layers. Linguistic terminologies like phonetic, morphological, syntactic, semantic, pragmatic etc describe the various layers in which language operates in conveying the speaker’s (writer’s) ideas and intentions to the listener (reader). Verbal cognition basically involves sounds, packaged into groups forming words, and from thereon into sentences. We know that ‘word’ is a collection of sounds, having a particular meaning. Words possess the potency to convey their specific meanings. The collective meanings of words in a sentence give rise to sentential meaning. The context of the sentence provides further clarity about the interpretation of the sentence meaning actually applicable in a particular instance. Further, there are factors of reliability of the verbal content, to make it to be verbal testimony. The process of generation of verbal cognition, the instruments of it and its classification according to the traditional schools of Indian philosophy is sought to be discussed in this article. Primarily, the view of the classic epistemologists of Indian tradition, namely, the naiyAyikas is presented herein with references to the other schools, when found pertinent. with sound and silence intertwined. When we hear a language foreign to us we find that our ears hear words, but we don’t make sense of what is being spoken. That is because language is not an object of merely the faculty of hearing, but goes way beyond that to be an entity of ‘comprehension’, involving the data being processed through the cognitive faculty of intellect, in the form of thoughts and ideas, ‘conveyed’ through a verbal or non-verbal medium. All beings have language. It is not merely a collection of words, but a vehicle of meanings coded in words, sounds or signs. Through non-verbal communication also what is understood by common people is usually interpreted verbally in the minds. Exceptions are there, like infants, auditorily as well as visually challenged people (like Helen Keller before she learnt language), the mentally challenged etc. For epistemological purposes, keeping in mind verbal communication among humans in general, we shall deliberate on the theories in Indian philosophy pertaining to verbal cognition, what cognition makes for verbal testimony and how it arises. To this end we shall again resort to the primers of the classic epistemologists of Indian philosophy, the naiyAyikas from the school of nyAya and touch upon theories of other schools, where their contributions have been notable. Please note that when we say verbal cognition, it only refers to cognition arising from communication using words in general and not only to that of oral communication. Which means, verbal cognition also includes cognition of written language. Potency is God’s will – The modern school of Indian logic (nyAya school) accepts that the potency of a word can be of the form of the personal will of the speaker. An instant of father naming the child any name he pleases; falls under this category. Through a SENTENCE, what is intended to be conveyed is NOT THE SENTENCE MEANING per se, but it is THE IMPORT of the speaker (writer) which is intended to be conveyed. Import of a sentence is that which is intended to be made known (to the listener) by being uttered (by the speaker). 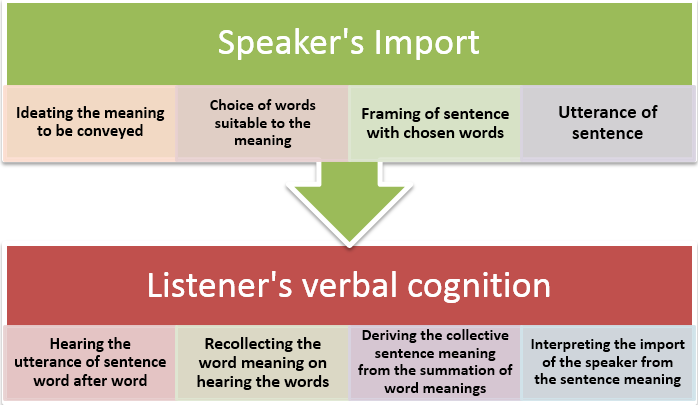 It is the import of the sentence (intended by the speaker) which is the cause of cognition of the sentence meaning (in the listener). That is, it is the import intended to be conveyed by the speaker that propels the speaker to encode the intended meaning through use of words in a sentence, which the listener can cognize by decoding the sentence meaning based on the comprehension of the meaning of the words framed in it. When this is done successfully, the communication is complete. Else, there is miscommunication or misinterpretation, leading to erroneous verbal cognition. Now, how this transition of import happens from the speaker to the listener is through the context. Words have the potency to convey more than one meaning. It is the context which decides as to which of the meanings would be chosen to grasp the import of the speaker most aptly. Verbal cognition is mediate cognition. That is, it arises from another cognition as its means. The cognition of words is the means of verbal cognition. For eg. To make sense of a sentence like – ‘Bring me some tea’ – the cognizer has to have the comprehension of the meaning of the individual words ‘bring’, ‘me’, ‘some’ and ‘tea’. To contrast, perceptual cognition is immediate cognition. That is, it does not depend on another cognition as a means. If there is a contact between the sense organ and an object related to it, perceptual cognition arises immediately, whether the object is previously known or unknown. For e.g., if there is a noise of birds chirping reaching the auditory sense organ, it will be cognized, despite the fact that the person who gets to listen to it has made no effort in that direction. Thus, while there is absolute similarity in the framework of the above sentences, the interpretations are highly subjective! Grammar – Grammar provides rules regarding the root, suffix etc and their semantic implications. Thus, the verb ‘cooks’ by rules of grammar would involve the root verb ‘cook’ to mean ‘the act of cooking’ and the suffix ‘-s’ which indicates the singular number of the agent of cooking as well as the present tense. Thus, through grammar the meaning of the word ‘cooks’ may be grasped as ‘the singular agent involved in the act of cooking at present’. Comparative cognition – There are instances when the name of an object is known through some source, but the object is yet unknown. A person familiar with the object usually uses analogy or resemblance with a commonly known object to familiarize the unknown object, to the person to whom the name of the object alone is known till now. However, till the object is actually perceived, definite knowledge of the object does not arise in the person who is familiar with a name while unfamiliar to its meaning. Whenever, on the basis of resemblance mentioned by a reliable source, an object of similar description is located, the resemblance is recollected and the name and its referrent meaning are cognized to be connected to each other. This is comparative cognition. For instance, if one were to be told that a south Indian dish called ‘meduvaDa’ resembles a doughnut in shape, but is salty and not sweet, then when the person encounters such a looking and tasting dish in a South Indian restaurant or during one of her visits to South India, she would recognize that dish to be meduvaDa! Lexicon – A most oftenly used resource for looking up what a word means or refers to is the lexicon. It does not beg elucidation as to how one can grasp the meaning of a word through the means of a lexicon. The word used in Sanskrit to refer to it is ‘kosha’ which usually means a thesaurus. Following it, an illustration of a synonym given in thesaurus is taken here as a means to grasp the sense of a word say – sodium chloride, as common salt. Utterance of a reliable source – Sometimes the meaning of words are grasped when they are imparted by some relaible source. For example, from an English Language Course a second language learner of the English language may come to know that what is called as ‘footpath’ in India is called as ‘pavement’ in the UK and as ‘sidewalk’ in the US. So the meaning of the words ‘pavement’ and ‘sidewalk’ are learnt through a reliable utterance by the learner. Usage – By observing the common usages in the utterances of speakers of a language, the relation between words and meanings could be grasped. For instance, toddlers observe usages of elders in the family like ‘bring water’, ‘pour water’ ‘bring toy’ etc. and gradually learn through the usages the meanings of the words ‘bring’, ‘water’ etc. Later, they are seen to form sentences on their own; even the ones unheard of by them before. Residual sentence – Sometimes the context in which a word is used gives the clarity about the particular sense in which it is used. This context is known from the rest of the sentence in which such an ambiguous word is used. This usually happens in the case of a polysemous word. In an utterance like – ‘the post was high, but the salary quoted was too low for it’ – the word ‘post’ could mean ‘a thin verticle structure’ or ‘the hierarchial position in an organisation’. From the rest of the sentence which refers to ‘salary’ etc. is fixed the sense of the word ‘post’ as ‘the hierarchial position in an organisation’ and not as ‘a thin verticle structure’, in the given instance. Description – The potency of a word to refer to some meaning could be grasped by means of description of the meaning with a different set of words, as in – “‘guru’, is a spiritual preceptor”. Proximity of a known word – Unfamiliar words or uncommon usages are sometimes grasped by virtue of the more familiar expressions and words of common usage used beside them. For example, in the sentence – ‘the schooner sailed safely to the shore’ the word ‘schooner’ is grasped as meaning ‘a ship’ by virtue of its proximity to the known words like ‘sail’ and ‘shore’. We have seen that words are related to meanings through potency. A word is a collection of sounds. The more pertinent question is – what is meaning? What is it that is actually referred to by a word? The different schools of philosophy have diverse viewpoints in this regard. As cognitive entities objects could have two aspects – individual and universal. Proper names and words referring to unique objects refer to the individual entity. 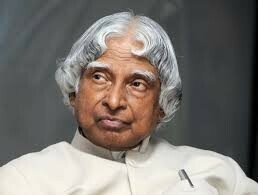 For example, when the name APJ Abdul Kalam is uttered, the meaning of the word referred is the actual person. Again, the word ‘ether’ refers to ‘sky’ (in common terminology) only as it is the singular referent of the word. However, common words like ‘cow’, ‘child’ etc have multiple referents. That is, a white cow, a black one, a brown one, cows of the various breeds all over the world are all referred by the word ‘cow’. In fact, we have an idea of the the cattle cow as a ‘universal’ one in our mind. It is owing to this cognitive form of cow that we have in memory that we are able to identify the various cows that we come across as ‘cow’, not requiring to be taught at every instance of an encounter with a cow as ‘this is a cow’. Now, the philosophers of different schools debate whether the words like ‘cow’ refer to the ‘individual cow’ or the ‘universal cow’. The view points of the various schools are summarised as follows in the treatise of dvaita-vedAnta by SrI jayatIrtha titled pramANa-paddhati as follows – “Only, jAti, the universal properties are denoted by words; vyakti, the particulars [individuals] are indirectly implied. This is the stand of bhATTa-mImAMsakas. Opinion of vaiSeshikas is that the particular [individual] is attributed by universal is denoted by word. vaiyyAkaraNas [grammarians] say that, the universal is denoted at times and particular [individual] is denoted sometimes. Somewhere universal is denoted; somewhere particular is denoted sometimes; and AkRti, form is denoted somewhere is the view held by naiyAyikas. bauddhas hold that double negation of referent is the sense of word. However, AcArya-madhva admits that the only particulars [individuals] are denoted by words and to know the denotation function of words, sAdRSya, the similarity of things to be denoted plays a major role as a factor”. The foregoing elucidation gives a consolidated view of the various schools of philosophy regarding the referent of a word. Etymological – Driver – The verb ‘drive’ refers to causing or ‘guiding movement’ and the suffix ‘-r’ refers to the agent or instrument of action. In simple terms, one who drives is a driver. Conventional – Benchmark – ‘Bench’ refers to ‘a long seat’ and ‘mark’ means ‘a visible impression’. However, ‘benchmark’ means ‘standard of excellence’. Conventional while being etymologically relevant – Computer. Any instruments that aids in computing could be termed as a computer. On that basis even a calculator or counting beads or even a person who is computing could be referred to by the word. But ‘a programmable electronic device used for data processing’ is commonly known as ‘computer’. Etymologically ‘compute’ is a verb that refers to act of mathematical calculation and the suffix ‘-r’ refers to the agent or instrument of action. The said electronic device does that function also and is hence the word is etymologically relevant too. Both etymological and conventional – Milestone – This word has two meanings, namely, ‘the stone functioning as a milepost’ and ‘a significant event or stage in the life, progress etc. of an entity’. Etymologically, ‘mile’ refers to a ‘measure of distance’ and ‘stone’ refers to ‘a small piece of rock’. So the first meaning of the word ‘milestone’ mentioned above fits to the etymological derivation, while the second sense is a conventional reference. Again, depending on the type of reference, words are classified in to two as words with primary (direct) signification and words with secondary signification (indirect suggestion). Primary signification – When a word directly refers or signifies to its meaning then it is considered to be a word with direct signification. For example, in a sentence like ‘the cat runs’, the word ‘cat’ refers to the common feline animal. Secondary signification – When in an utterance the direct meaning of a word does not fit the context, though related with it, then secondary signification of the word is resorted to. For example, in an expression like ‘the pen is mightier than the sword’ the word ‘pen’ does not refer to the instrument of writing per se, but to the motivational composition of an author. Even while the composition were, say, typed out or printed, and not written with a pen, the saying does hold good in such a context also. Here the primary signification of the word ‘pen’ referring to ‘a writing instrument’ is sublated and a sense related with the act of writing or composition is signified through suggestion. While prior knowledge of words and their related meanings is imperative for verbal cognition to arise, there are also certain auxiliary causes to this end. They are expectancy, compatibility and proximity. A sentence devoid of any one of these is considered to be fallacious. Expectancy (AkAn`shA) – The experience of lack of relatedness felt in a word due to the absence of another (related) word in the sentence is called expectancy. That is, after a word in a sentence is uttered, there is an expectation with regard to the utterance of the other word or words connected with the word uttered, in order to complete the import of the sentence. That is called as expectancy. For e.g., an unintelligible collection of words – red spinning crow bottle – will not be considered as a valid sentence due to lack of expectancy among the words. Compatibilty (yogyatA) – Compatibility is non-contradiction of meaning. That is, where the meaning arising out of a sentence can be contradicted by any other experience or kind of evidence, there is considered to be lack of compatibility between the meanings of the words juxtaposed in a sentence. Such sentences are considered to be invalid. While the sentence may even be correct grammatically or intelligible for imagination, say as in a fairy tale, the words with incompatible meaning in a sentence do not conform to reality reality. Hence they are considered to be erroneous. For e.g., a sentence like – sprinkle with fire – will not be considered as a valid sentence as the property of being sprinkled is incompatible with the object, fire. Proximity (sannidhiH) – Utterance of words in a sentence without undue delay is called proximity. For e.g., a sentence like – bring……………me……………..water – completed over hours by being uttered in bits and pieces with long gaps will not be considered as a valid sentence. tarkasan`graha classifies sentences in to two – worldly and Vedic. The sentences of common usage by people in all types of worldly transactions are mundane sentences. Such sentences gain veracity only when uttered by a reliable source. The Vedic sentences, on the other hand are valid in toto as they are utterences of God. In the orthodox schools of Indian philosophy, Vedic sentences enjoy a peculiar status of superiority owing to their divine connection. While there is debate over the question of authorship, their divinity and thereby their authority is unquestionable in these schools of thought. While mImAMsakas and the vedAntins ascribe eternality to Vedas, the naiyAyikas contend that God is the author of the Vedas. As God is omniscient, God’s body of work is all valid in entirety. Verbal cognition is a very intricate, nay, a very mysterious cognition. Many times, living beings use sounds as a means to interact. While animals have limited purpose and scope for language development, the same with humans is exponential. If we would ponder on the way we have trained our brain and vocal organs to convert sounds in to languages, and also developed a system of symbols to represent them in writing, it is amazing. Wonder how much of time and effort of our lives are dedicated in acquiring, using and interpreting the verbal cognition! nyAyasiddhAnta-muktAvalI, viSvanAtha-pan~cAnana, kASI saMskRta book series 212, caukhambA saMskRta saMsthAn, Varanasi, 1995.
 nAnArtha-anurodhAt tu prakaraNAdhikaM tAtparya-grAhakam. Ibid. jAtireva vAcyA, padAnAM vyaktayastu lakshyA iti bhATTAH. jAtiviSishTAH vyaktayaH vAcyAH iti vaiSeshikAH. kvacijjAtiH, kvacidvyaktiriti vaiyAkaraNAH. kvacijjAtiH, kvacidvyaktiH, kvacidAkRtiH iti naiyAyikAH. anyApoha iti bauddhAH. vyaktayaH eva vAcyAH, samayapratipattau tu sAdRSyamupadhAnaM ityAcAryAH. – Translation courtesy – The Path of Proofs’, Pramanapaddhati of Sri Jayatirtha, English rendering by Shrinivasa Varakhedi, Dvaita Philosophy Resource Centre, Manipal Universal Press; text in  and Romanisation of Sanskrit text article’s author’s.